Fresh peaches dipped in funnel cake batter, deep fried, rolled in cinnamon sugar and served with whipped cream or ice cream. Need we say more? Heat 3-4 inches of oil to 375 degrees in a heavy pot or deep fryer. Mix all funnel cake batter ingredients together until smooth. Dust peach slices in flour and dip in funnel cake batter. Immediately place in oil and cook until golden brown. 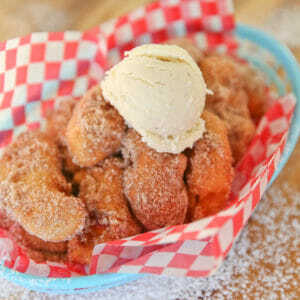 Place directly in cinnamon-sugar and then top with ice cream or whipped cream.